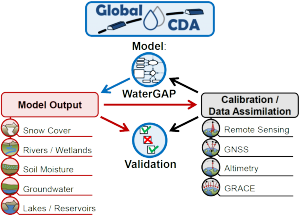 Understanding the global freshwater system by combining geodetic and remote sensing information with modelling using a calibration/data assimilation (CDA) approach. (1) develop a multi-observation ensemble-based calibration and data assimilation (C/DA) methodology to combine observational data of model output variables (time series of gauge-based streamflow, GRACE/GRACE-FO total water storage variations, remotely-sensed extent and level of surface water bodies, snow cover, glacier mass change and streamflow) with hydrological models in an optimal manner. (2) exploit this methodology with the global hydrological model WaterGAP to provide an improved quantitative assessment of freshwater fluxes and storages including their uncertainties in response to climate and anthropogenic forcing. To reach these goals, nine partners work together, collaborating with two Mercator fellows. The Goethe University Frankfurt and the University of Bonn coordinate the project.